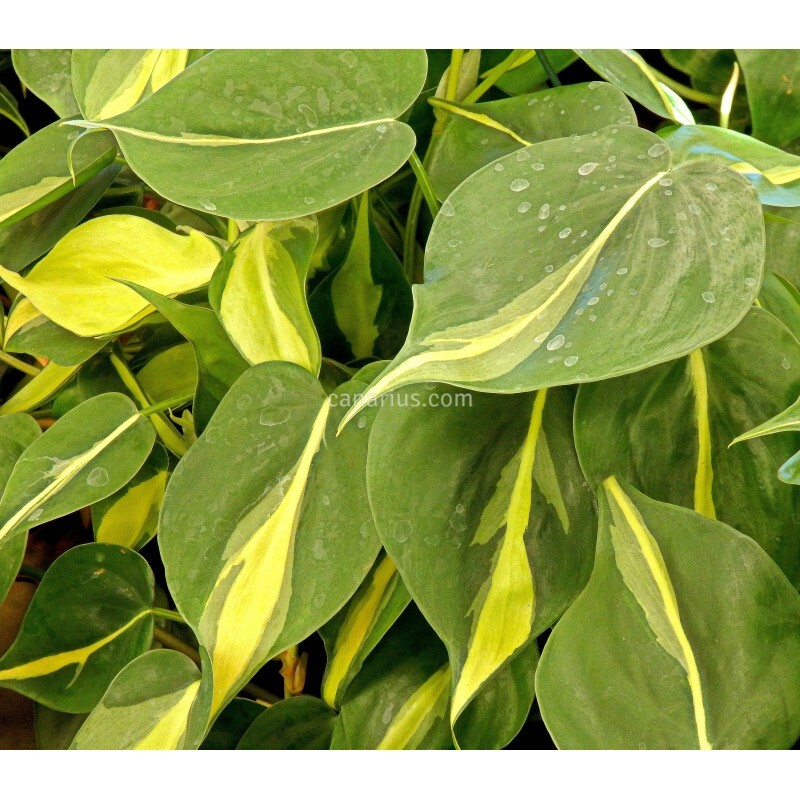 Variegated selection of "heartleaf philodendron", a popular climbing tropical aroid. Suitable as an indoor plant, in baskets or poles. The wild, green form is widespread in tropical America and it was formerly called Philodendron scandens. "Brazil" is a variegated selection of "heartleaf philodendron", a popular climbing tropical aroid. It is suitable as an indoor plant, in baskets or poles. The wild, green form is widespread in tropical America and it was formerly called Philodendron scandens. This is a climbing tropical aroid. It naturally grows in forest areas and it can grow in many ways: it can creep on the ground, climb on tree trunks or rocks and also hang down from the branches. Just like many tropical aroids, this species has a juvenile form and a very different adult form. We offer for sale the juvenile form, which has smaller leaves, generally hearth shaped and thinner stems. After some years in good light, the plant will slowly become adult, so the stems will be thicker and the leaves much larger and wider, with a different shape. Then it will also be able to flower and fruit. In cultivation, they are versatile too and they can be used as groundcovers or ivy-like climbers in frost-free areas or used indoors as house plants for hanging baskets or climbing poles. The juvenile form of this species is perfectly adapted to indoor conditions and makes an excellent house plant. It will grow in any room with bright light and it is easy to mantain. It is also used in tropical greenhouse settings or in the terrarium, together with bromeliads and other indoor plants.